The Alta rock art area is the largest concentration of Stone Age rock art in Northern Europe. This paper is a brief presentation of the rock art of Alta, Northern Norway. An overview of the sites with rock art in the Alta Fjord region can be found in Fig. 1. The find history of the rock art sets the historical background. Then the chronological framework for the rock art is presented, followed by a presentation of the rock art including the fascinating narrative hunting and fishing scenes and compositions where the interaction between rock art and natural features will be discussed. Some of the panels with rock art stand out as representations of miniature landscapes including references to landscape features such as lakes, rivers, and valleys where the rock art is deliberately placed in relation to these features. The Alta rock art was discovered in 1973. It was inscribed on the UNESCO World Heritage list in 1985. New rock art is found every year adding to this large rock art record of the past. At present the Alta rock art area comprises numerous rock art sites with c. 6000 petroglyphs and five sites with rock paintings, in total about 100 figures. The rock art was made over 5000 years from about 5200 BC until about 0 AD. It is often referred to as hunters’ rock art, also named northern tradition rock art of Scandinavia. Central to the rock art is large game; bear, elk, reindeer, but also halibut, seabirds, salmon, seals, and whales are depicted. Adding to this a large number of human representations are depicted in various activities. There are also boats and various artefacts such as bow and arrows and spears. The Alta rock art shows a unique narrative in scenes and compositions such as bear hunting, elk hunting, halibut fishing, reindeer hunting (see Fig. 2), sealing (see Fig. 3), and whaling. Some of the scenes cover more than 10 m of rock, where the figures and scenes are interacting in the storied rocks of the Stone Age. Returning to the same place for more than 5000 years makes Alta one of the nodes in prehistoric landscapes central to people inhabiting northern Norway and possibly beyond. 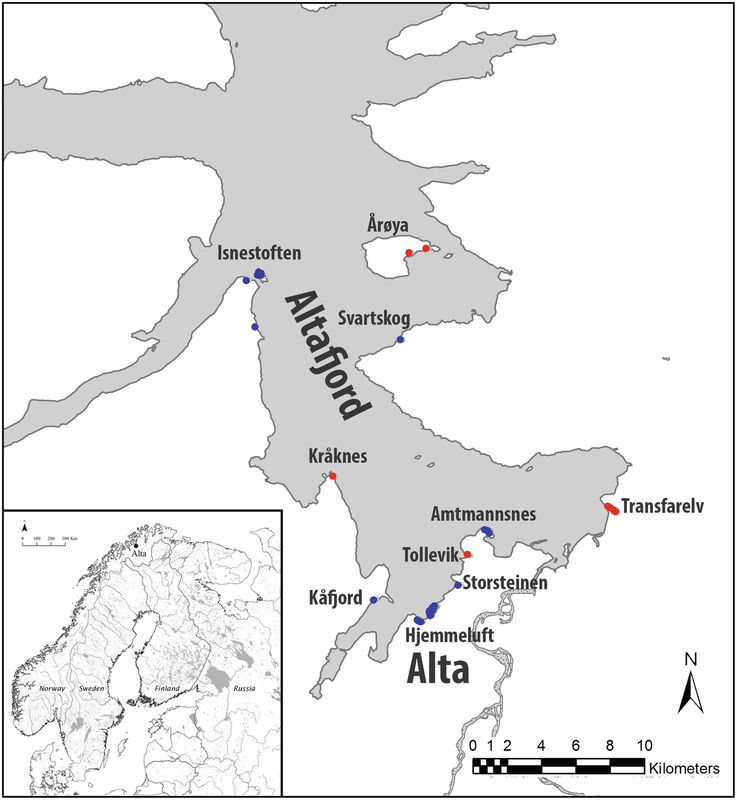 Alta can be seen as a meeting place in the past central to people living in the area, likely used by inland and coastal groups (Fuglestvedt 2017; Gjerde 2010; Helskog 2014; Hood 1988). 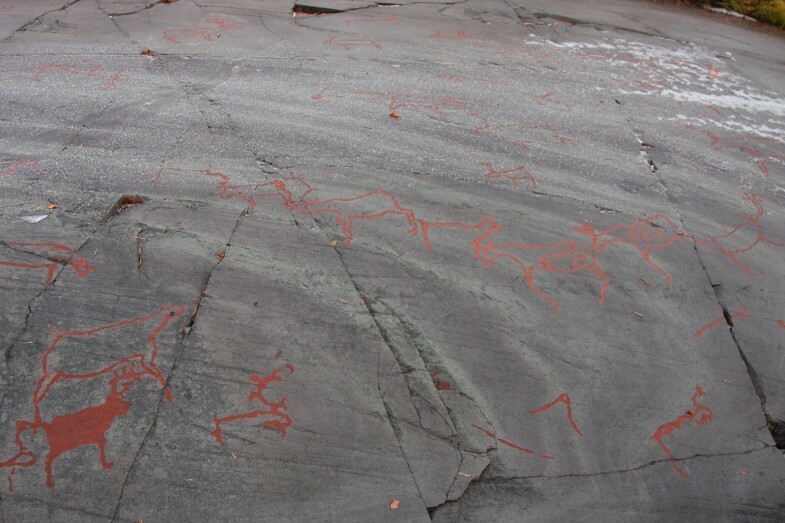 The first rock art in Alta was discovered in 1926 by a Finnish ethnologist, Samuli Paulaharju, the rock paintings at Transfarelv (Transfarelvdalen) (see Fig. 4). However, it was not until 1966 that the archaeologists became aware of the rock paintings and documented them (Simonsen 1969). In the 1960s a small boulder with one human figure was discovered at Gjermunds by about 20 km from the main concentration of rock art later discovered at Hjemmeluft. It was named Isnestoften and later Isnestoften 1. 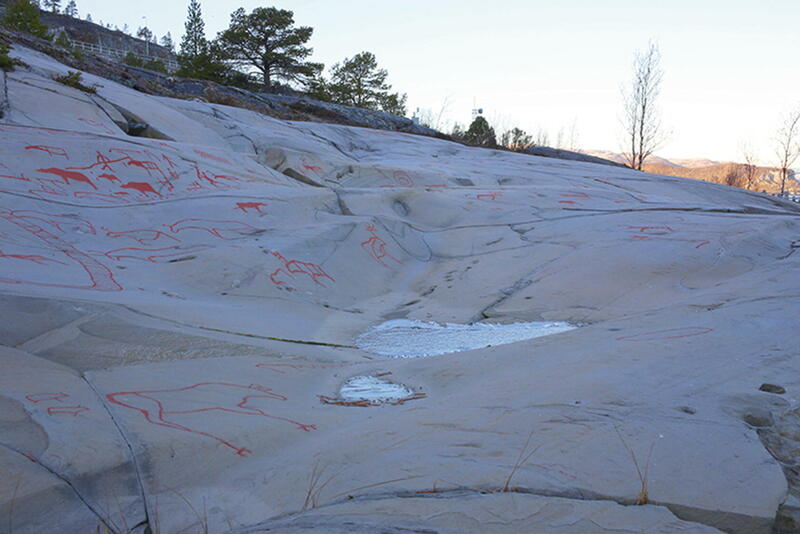 Then in 1973 petroglyphs were discovered in Hjemmeluft at Ole Pedersen and at Storsteinen (Eng. the large boulder), defining Alta as a large rock art area. Since then rock art has continuously been discovered in Alta, the petroglyphs at Amtmannsnes in 1978, and the petroglyphs at Kåfjord in 1978. The second site with paintings at Transfarelv was found in the 1970s. 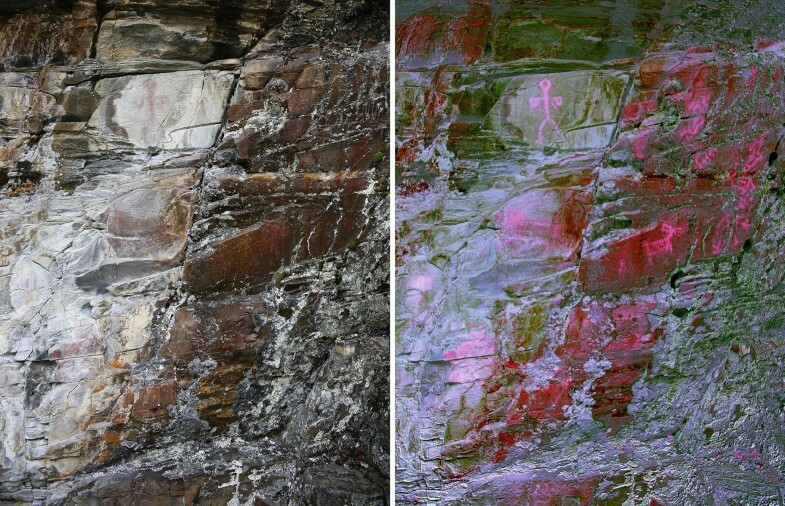 Boulders with rock art at Isnestoften were discovered in 1998 and 2008 and paintings at Tollevik (Komsa) in 2000. Between 2002 and 2004, three new rock painting sites were found at Transfarelv. During the last years, five new sites have been found: petroglyphs at Svartskog 2016, rock paintings at the island Årøya (Årøya and Kongshus) in 2017 and 2018, and a boulder at Isnestoften in 2018. The rock art in Alta includes the five sites known by the World Heritage Listing, i.e., four sites with petroglyphs, Amtmannsnes, Hjemmeluft, Kåfjord, and Storsteinen, and the paintings at Transfarelv. Considering that several sites have been discovered in recent years, more rock art is likely to be found in the Alta region in the future. An updated record of the Alta rock art can be found at the Alta Rock Art Archive at Alta Museum (www.altarockart.no/). A key issue to the dating of the Alta rock art is the notion that the rock art is made in the shore zone and that the land uplift has changed the elevation of the rock art in relation to the contemporary shoreline (Helskog 1983, 1999). 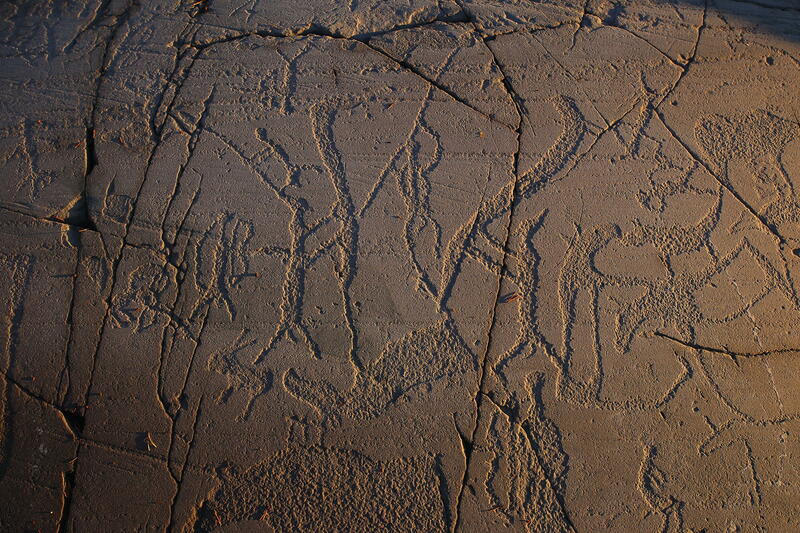 The petroglyphs in Alta are located between 26.5 masl and 8.5 masl. 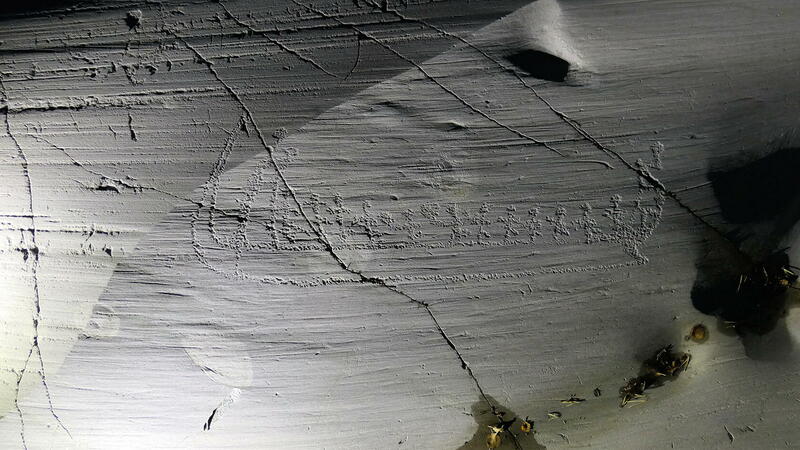 The rock art at the same elevation holds the same or similar style in figures and selection of motifs (Helskog 2014). An example of this is the bear hunting scenes and the reindeer corrals that are all located between 22 masl and 26 masl. Another factor is that no scene or composition crosses the 2 m elevation. Even scenes of bears and bear tracks that can be followed for more than 8 m follow a horizontal orientation and do extend vertically the 2 m vertical limit. This also corresponds with the sea spray where the shore zone directly above the tidal zone is vegetation-free (from lichen and moss), hence making the figures more visible. The functional reasoning for placing the rock art in the shore zone has been further strengthened by Helskog (1999) in his study of rock art in relation to arctic hunter-gatherer cosmology where the rock art is placed in a three-tier cosmology in the middle world between the sky (upper world) and the sea (lower world). These factors as well as the extraordinary situation in Alta where the selection of motifs and composition follows the same elevation make shoreline dating a good method for dating the Alta rock art. The studies by Helskog found the rock art to be made between 4200 BC and 0 AD (Helskog 1983, 1988, 2000). Excavations near the rock art area and a revision of the geological data made Gjerde suggest the initial rock art in Alta dates to c. 5200 BC (Gjerde 2010). This was later supported by Helskog (2012d, 2014) with minor modifications. 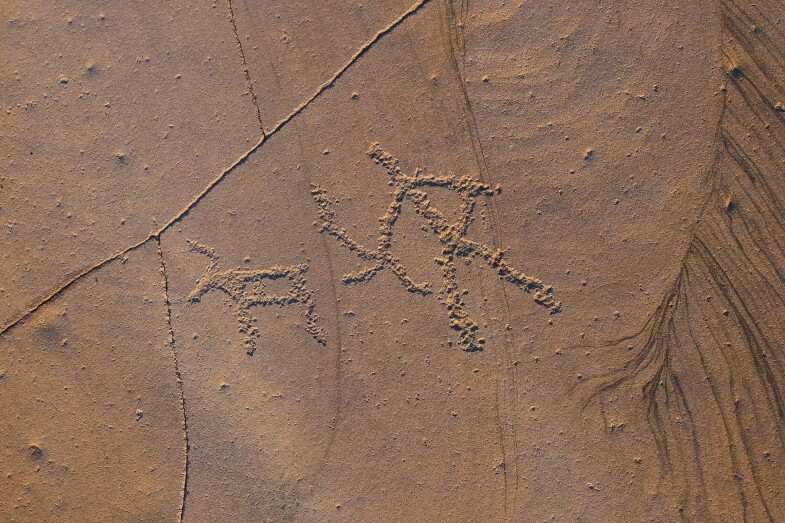 This current record and dating shows rock art was made during a period of c. 5000 years between c. 5200 BC and 0 AD. A tentative chronological scheme of the rock art in Alta is found in Fig. 5. Between 26.5 masl and 22 masl, we find the earliest rock art in Alta, dated to between c. 5000 and 4000 BC. Some of these earliest panels with rock art in Alta are made up by several narrative scenes, and compositions stretching for more than 10 m in length include several hundred figures (see Fig. 6). The dominant motifs are large game with focus on elk and reindeer. 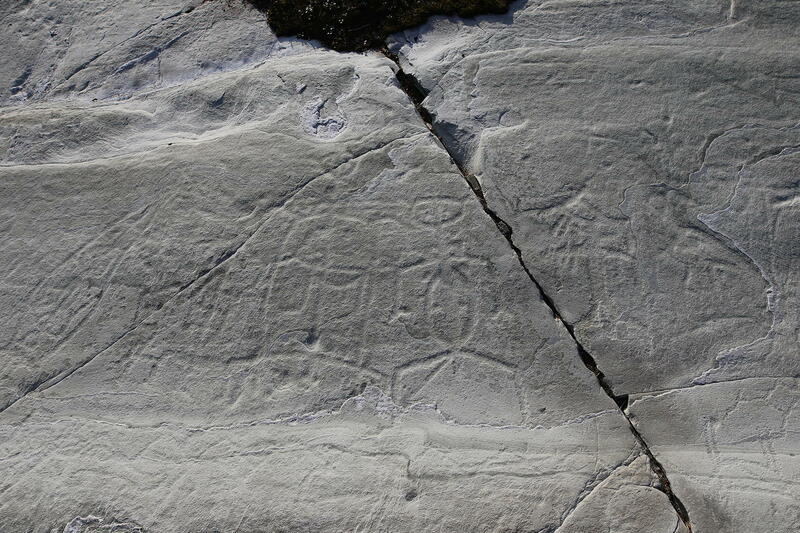 The motifs include human representations, reindeer, elk, fish, bear, whale, seabirds, and geometrical patterns. What is prominent from the earliest rock art in Alta are the scenes and compositions depicting people in various activities, such as bear hunting, elk hunting, reindeer hunting (see Fig. 2), halibut fishing from boats, and what appears to be ritual activities (see Fig. 7). The boats have elk-head stems. The boats take part in various maritime hunting scenes, such as halibut fishing and sealing (Gjerde 2016). There are also many artefacts depicted as part of the activities, such as bow and arrows (see Fig. 2), spears, and elk-head staffs (see Fig. 7). The characteristic bear tracks are sometimes connected to bear dens where one at times can follow the bear tracks for about 8 m along the panel. We also see several reindeer enclosures and reindeer corrals, some of which hold drive fences guiding the reindeer (Helskog 2012a, b). Between 21 masl and 17 masl, the rock art is dated to between c. 4000 BC and 3000 BC. The dominant motifs are still a large game with focus on elk and reindeer. In general, the motifs are similar to the earlier period. The seabirds are more frequent here, but there are still only a few figures. The large panels contain scenes and compositions such as bear hunting. The boats change in style, and the hull is more prominent, while the elk-head stem is still a feature. Some of the boats are involved in maritime hunting, such as sealing and possibly whaling small whales. The large narratives found in the earliest rock art are not that evident, and the large reindeer corrals and the numerous bear tracks are now missing from the record. Between 16 masl and 14 masl, the rock art is dated to between c. 3000 BC and 2000 BC. We now see a change in the motifs. 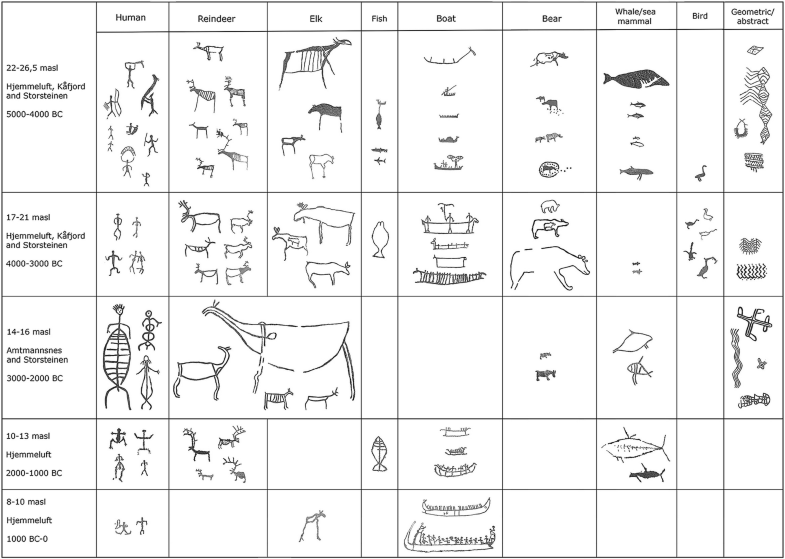 Most notable are the large human representations and the large animals (see Fig. 8). No boats have yet been documented from this period. Another notable feature is that it is not as easy to distinguish the species of some of the deer figures (elk or reindeer). 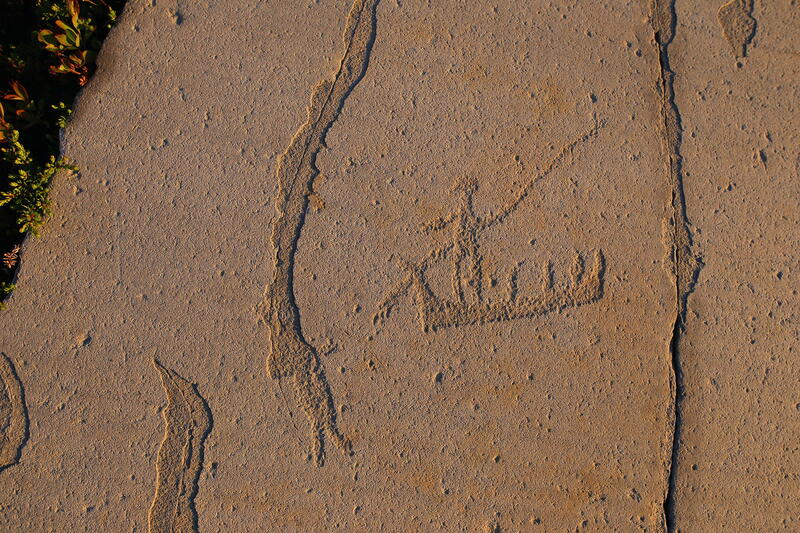 While the rock art from between 5000 BC and 3000 BC included humans depicted in activities, the narrative scenes are no longer found in the record. Between 13 masl and 10 masl, the rock art is dated to c. 2000 BC until c. 1000 BC. In this period, less rock art is made in Alta. The most notable change from the previous period is that the elk is missing from the record. The boats have a different style than the earlier boats from Alta. Boats of this period have been compared to the South Scandinavian Bronze Age boats and show similar traits (Gjerde 2017; Helskog 2012c; Kaul 2012). Another stylistic feature is the large “oversized” antlers of the reindeer. One of the scenes shows what is likely to be two human figures in a sword fight with swords and shields, similar to the “warrior scenes” in South Scandinavian Bronze Age rock art (e.g., Toreld 2015). Between 10 masl and 8 masl, the rock art is dated to c. 1000 BC until c. 0 BC/AD. This period reflects the previous period, and only a few figures are found, including one elk, but no reindeer figures. We find several boat depictions comparable to the South Scandinavian Bronze Age and Iron Age boats (Gjerde 2017; Helskog 2012c; Kaul 2012) (see Fig. 9). The sites in Alta are some of the best examples of interaction between rock art and natural elements, the art and the canvas. This is especially true for the earliest rock art dated to between c. 5000 BC and 3000 BC. Some of the panels seem to be miniature landscapes where the figures are placed in relation to the topography of the rock, pools, cracks (see Figs. 6 and 10), and discoloration or other features in the rock. These natural elements may represent valleys, rivers, or lakes, and the rock art figures appear to interact with these features (Gjerde 2010; Helskog 2004; Helskog and Høgtun 2004). Bergbukten 1 at Hjemmeluft (see Figs. 6 and 10) contains more than 300 figures and is dated to c. 5000 BC–4000 BC. This panel holds several clues to seasons in rock art, such as the autumn reindeer corral and the bear dens and spring bear hunting (Helskog 2012b). Hence, it has been interpreted as a “panel of the year,” representing seasonal activities (Helskog 1999, 2004). On some panels, the rock art interacts with the canvas or the natural features of the rock. At the Ole Pedersen 11A panel in Hjemmeluft, dated to c. 4000 BC–3000 BC, the canvas of the rock appears to be a representation of the aurora borealis, the northern lights (Tansem and Johansen 2008). The figures appear to interact with the natural elements taking part in the storied rocks (see Fig. 11). The rock art is related to the natural elements of the rock so that the panels appear to be miniature landscapes. In some cases, the rock art may also signify the place of the activity, such as the bear dens, the halibut fishing from boat, and the shore zone represented by people in boats driving reindeer onto the shore where a hunter is waiting for them. These may be clues to the physical landscape, geographical references included in the rock art (Gjerde 2010). Some rock art panels may represent “maps” including information on activities, seasonality, and places in the landscape. The Alta region holds numerous Stone Age settlements. Within the same area, there are also Stone Age quarries. Few attempts have been made to integrate the rock art into the rest of the prehistoric remains in the Alta Fjord region. The main future direction is to see how the rock art relates to the settlements and other cultural remains in the area. An ongoing research project is currently focusing on these topics.